Remember that whining sound from last night? As we emerged from a soggy, dew coated tarp, we quickly discovered what it was. On a distant hillside we saw hundreds of white specks, and as we listened closer, we realized the whining was actually sheep baahing. The sheep and their Basque herders have returned. 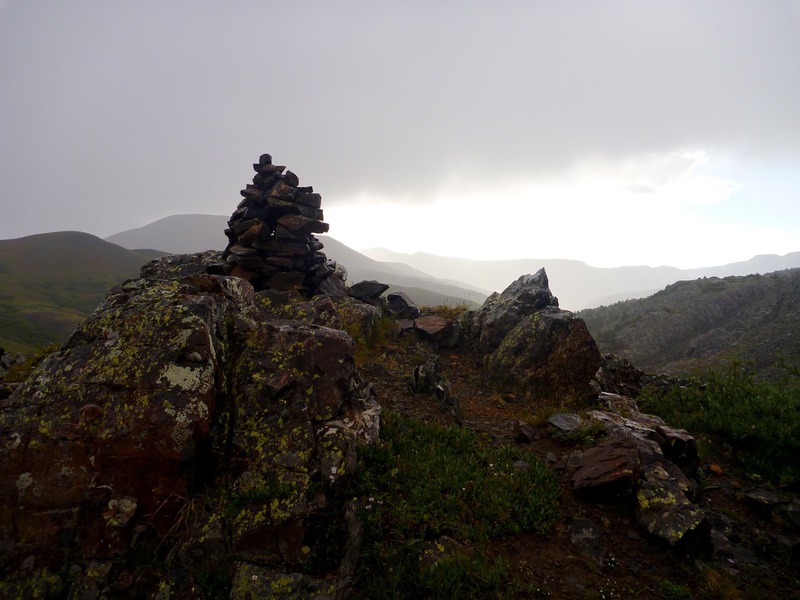 We packed up camp and headed along the trail that winded around a mountainside to Stony Pass. Below us we saw a large white tent, more reminiscent of a house than your typical backpacking tent, with smoke coming out of a cozy looking chimney. A while horse grazed in front of the tent, creating a surreal landscape of nomads, mountains, warmth, wilderness and beauty. I was happy to be feeling much better than yesterday. The malaise, the constant feeling of wanting to curl up on the tundra had evaporated. Clouds hung low this morning, and that fog soon turned into a very light misty drizzle. 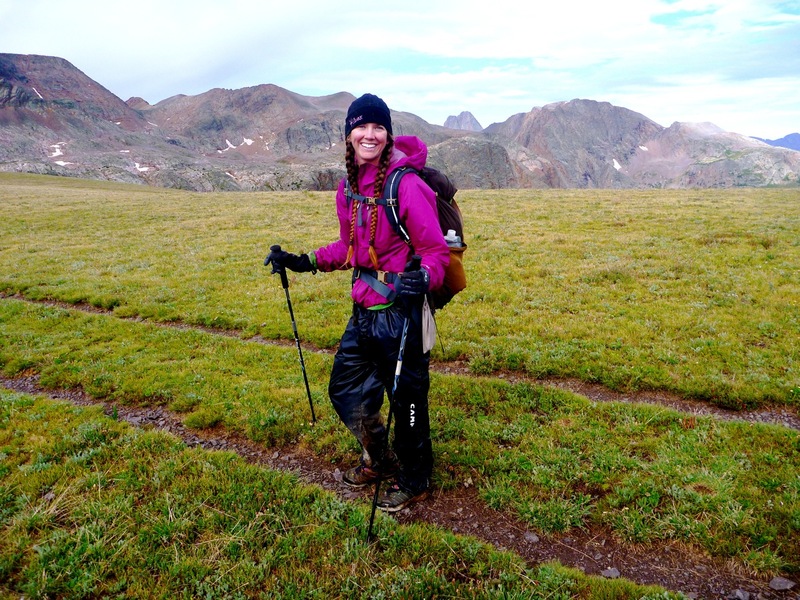 It's rare to have rain in the mornings in Colorado, but these are the San Juans, and normal rules do not apply here. The trail ended at an intersection with Stony Pass. I have a bit of history here, as Meriwether Johnson and I had a nice little climbing duel on this pass on our C.T. trip back in 2003. Meriwether took the tape and the place has lingered with me since. Steep, rocky (it is, afterall, named Stony Pass) and almost painfully beautiful. It is my favorite mountain pass in Colorado. It no longer serves a purpose as the mining days are long gone, and it never was a very effective route…too steep, too gnarly, too damaging on horses, men and gear. A place where wilderness was tougher than man. 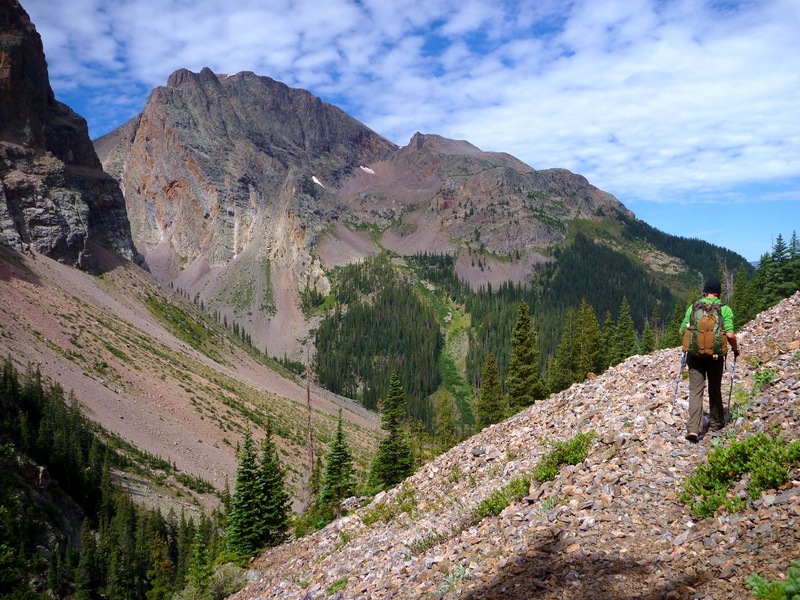 We headed across the pass into the Weminuche Wilderness. It was good to be back in Wilderness. Why this is Wilderness and the preceding 30 miles are not, I do not know, for they are equally spectacular and deserving of protection. A spectacular morning it was. The fog lowered and the rain picked up, but it mattered little, as my combination of long johns, wool and the magic coat and pants worked perfectly. 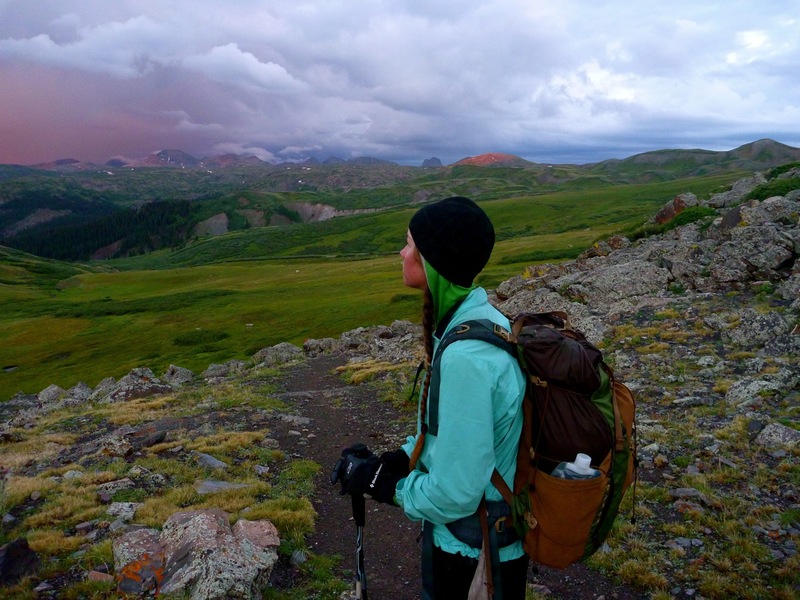 Have I discovered the perfect solution for a Colorado rainstorm? Doubtful, but it was working. After travelling for 400 miles with a partner, you get good at recognizing non-verbal signals. Based on her gait and stance, I could tell Elaine was hurting. Sometimes eating breakfast gets tiring out here, but it needs to be done. I encouraged her to eat her bar, and within minutes she was back to her usual self. It was amazing how quickly the food made an impact, but also how rapidly we were now falling into distess if we didn't eat. It was much like having a car nearly out of gas, putting a gallon of 94 octane in it, running it well, and then running out of gas and repeating the process. We needed a fill up. 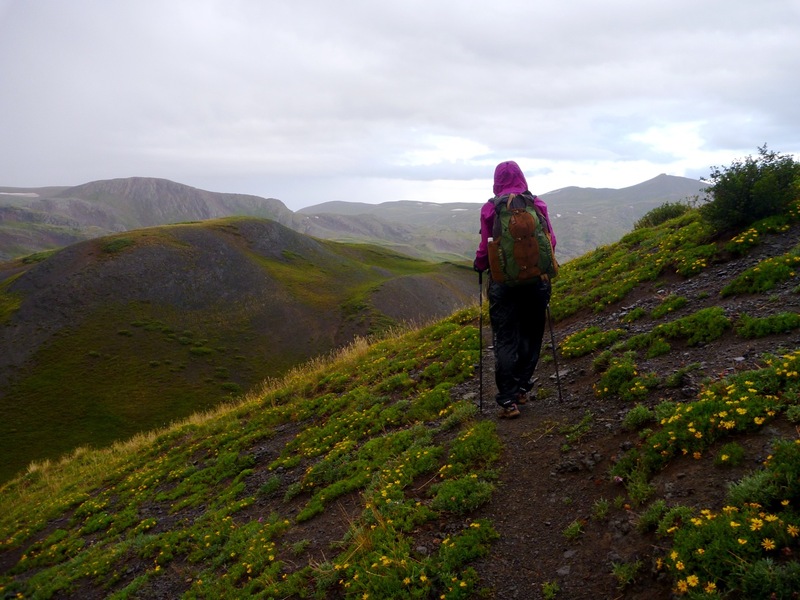 We made the decision to hike approximately 20 miles and spend the night in Silverton, and then spend the next day eating anything and everything – pizza, burgers, shakes – you name it. The goal of the stop? To fill up our tanks as much as our racing metabolisms would allow. Once that decision was made, morale improved dramatically. 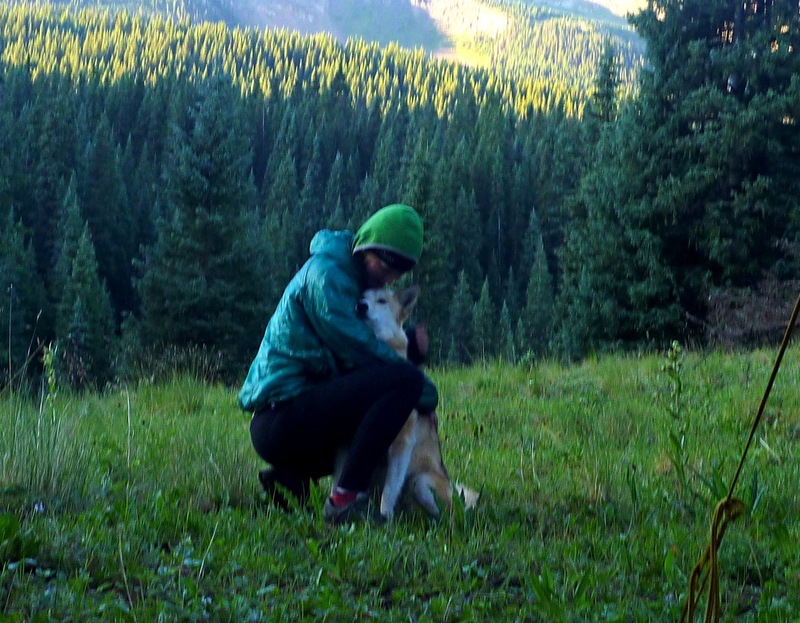 This was one of my favorite mornings on the entire trail. 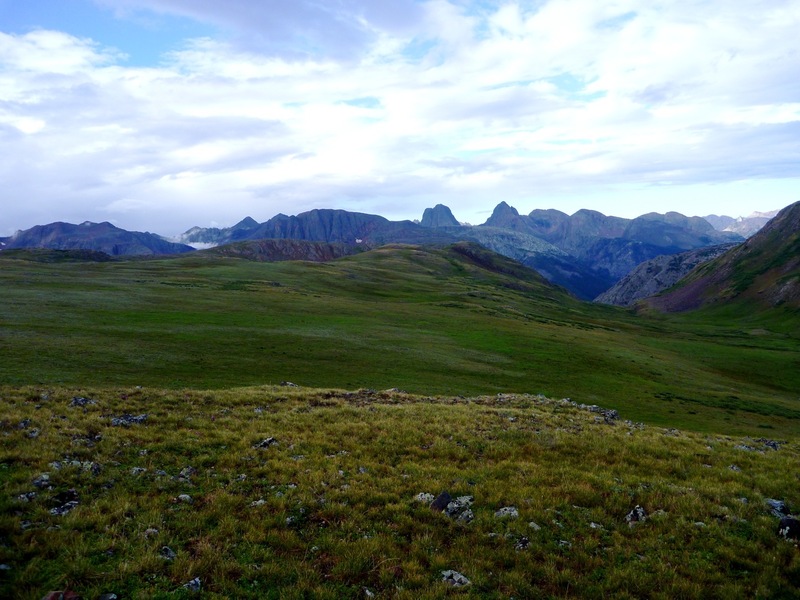 It essentially followed the very top of the Continental Divide, far above trees and towns.The San Juans continue to amaze and I must admit the mind drifted a lot, thinking about what living in Silverton would be like. 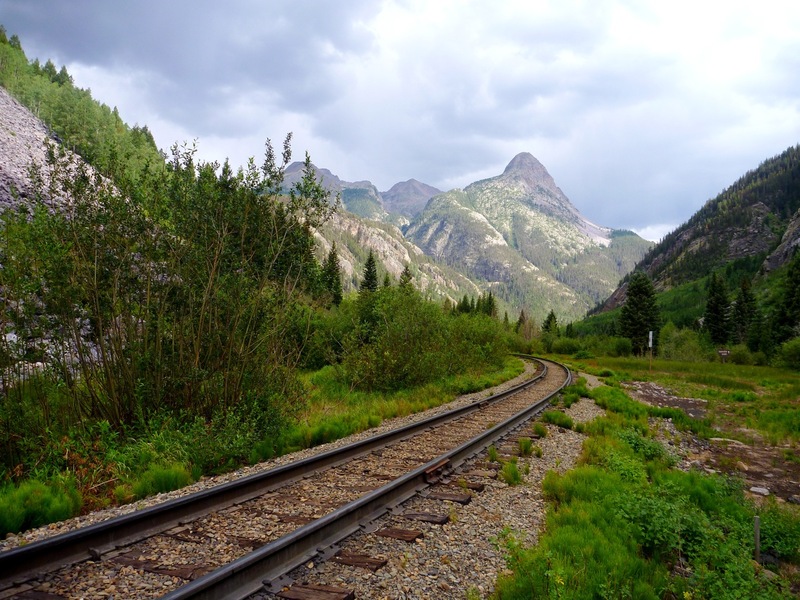 Silverton is an odd tourist town that relies on income from Texans who ride the narrow gauge to survive. There isn't much work, and some may argue it's isolated. Yet there is no arguing that Silverton has the most spectacular mountain setting in the enire country. Silverton has massive mountains ringing it on all sides. 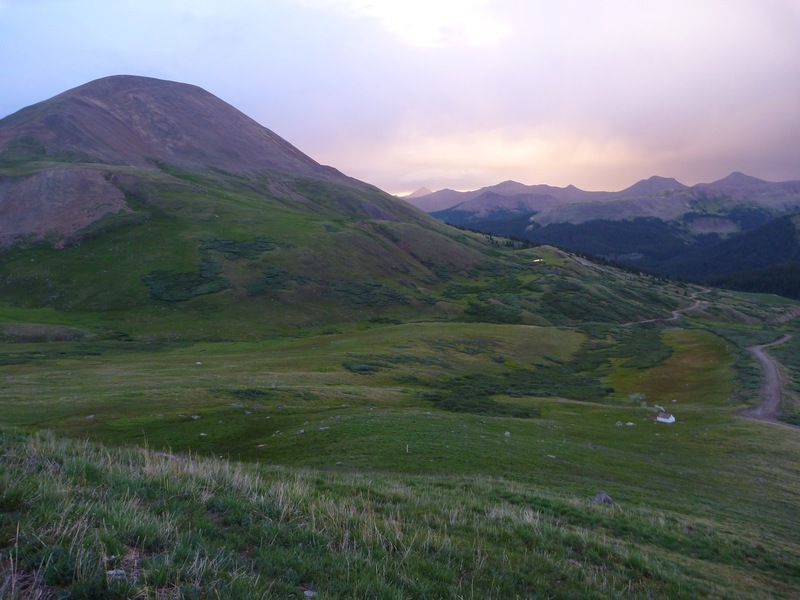 Even Crested Butte, as wonderful as that place is, has a large valley on the south side. 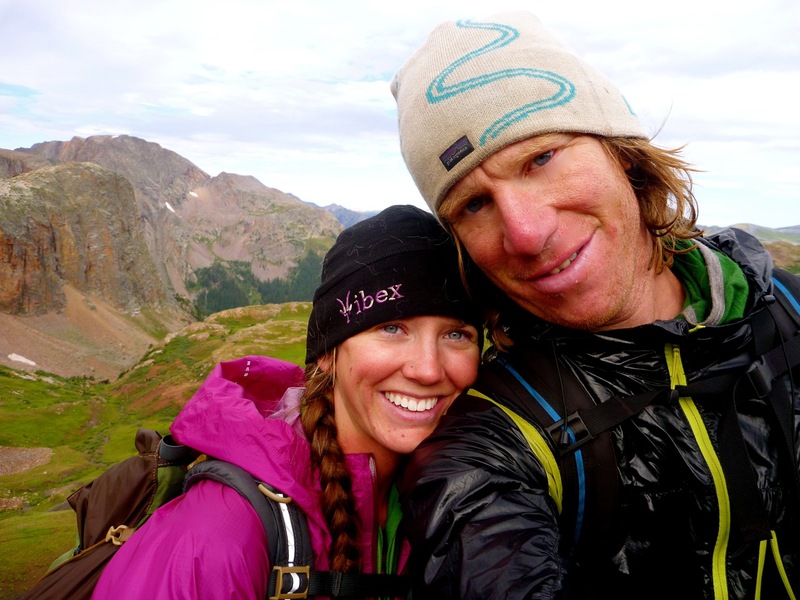 Silverton's geography is both entrapping and awesome at the same time. It seems the potential for adventure here is unlimited. We passed a series of small lakes where a number of travellers were camped, including a guy who we'd been yo-yoing with for the past two days. We passed him early two days ago, near the initial sheep camp, and he came by us yesterday evening when we stopped early. 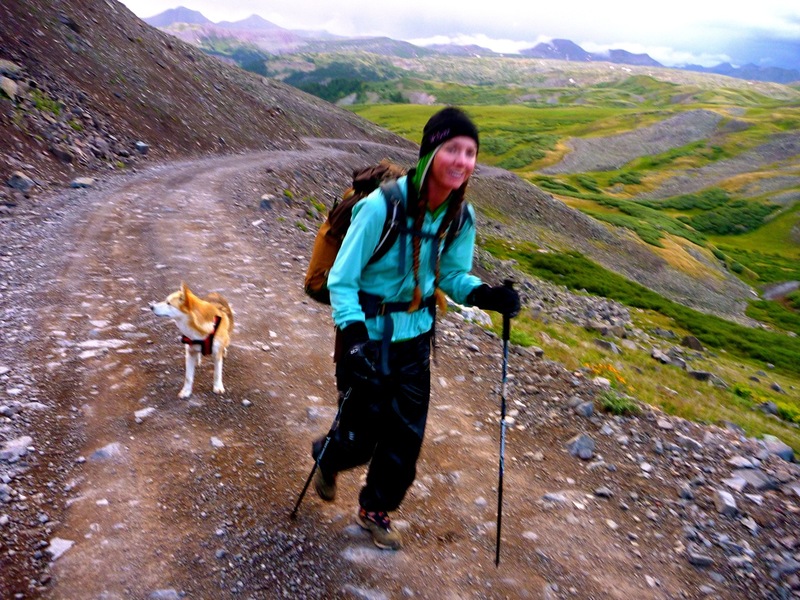 It's funny – you don't see many people out here as a thru-hiker, but you do tend to see the same people. 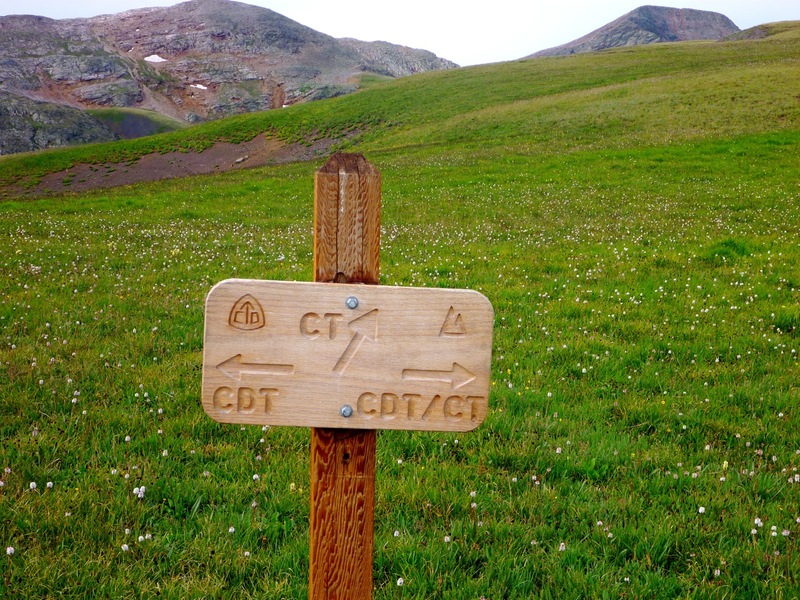 We passed a junction where the Continental Divide Trail and the Colorado Trail split for the final time. Our route, the more travelled Colorado Trail, headed west and eventually dropped out of the mountains to Durango. It was the more popular route of the two. Yet I must say, the slightly fainter Continental Divide Trail, heading left along the very spine of the nation all the way to Mexico, called to me. It's a distant call, but it's there. 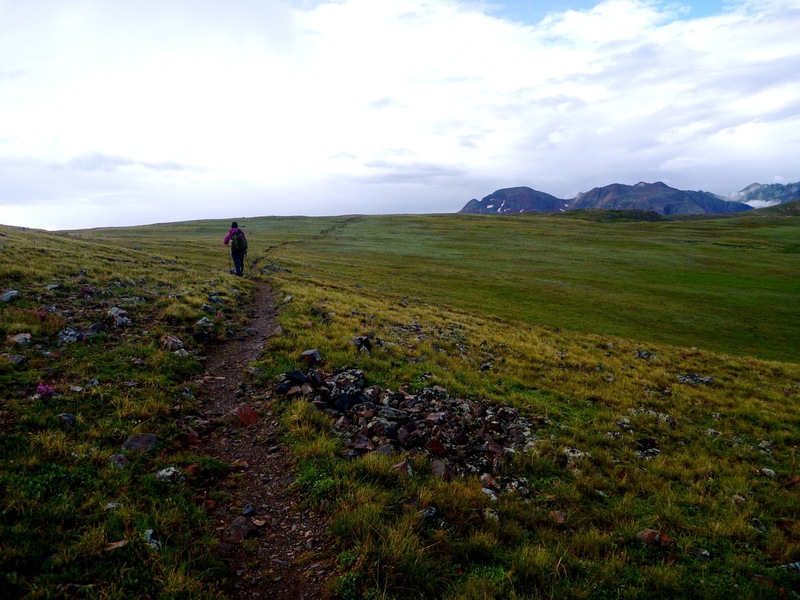 Elaine and I have talked about it much, and if there is one long distance trail that appeals to us more than the others, it's the Continental Divide Trail. It's the longest (3,100 miles versus 2,600 for the PCT and 2,100 for the AT), it's relatively unmarked and it passes close to our home. 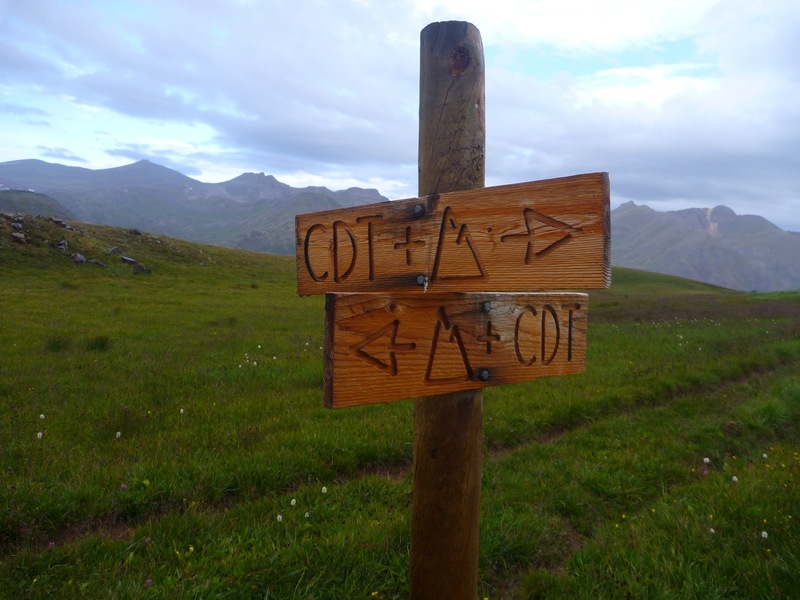 Someday, I have no doubt, we will hike the Continental Divide Trail, and it will probably happen sooner than later. It is the road less travelled, and of course that appeal is irresistible. The trail left the junction, headed up a slight rise, and dropped straight down a series of switchbacks. It was the most elaborate set of switchbacks on the entire trail – perhaps 25 or so in a section of hill that, at most, was about a quarter mile from top to bottom. 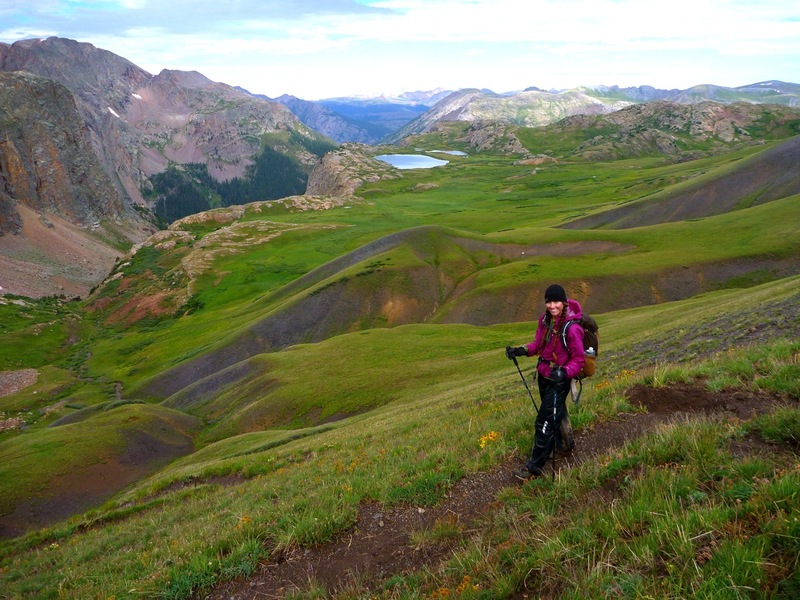 The switchbacked trail overlooked two hanging alpine lakes, nestled above a sheer cliff, dominated by the massive San Juan mountains. It was a scenescape more fantasy than reality, yet it was absolutely, positively real. We passed two trailworkers up early, digging in the dirt, and I envied them slightly, for they have the most beautiful office in the world. 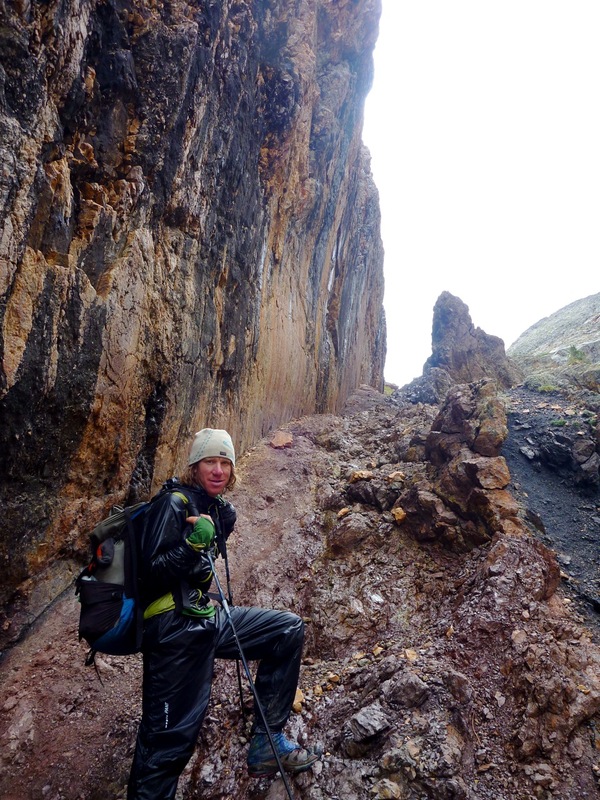 The switchbacks dropped to a gully next to a river. Down, down, down we went, past ancient mining buildings, waterfalls, cliffs and lakes. The trail entered forest – it had been a long time since we'd been hiking in trees – and mellowed considerably. 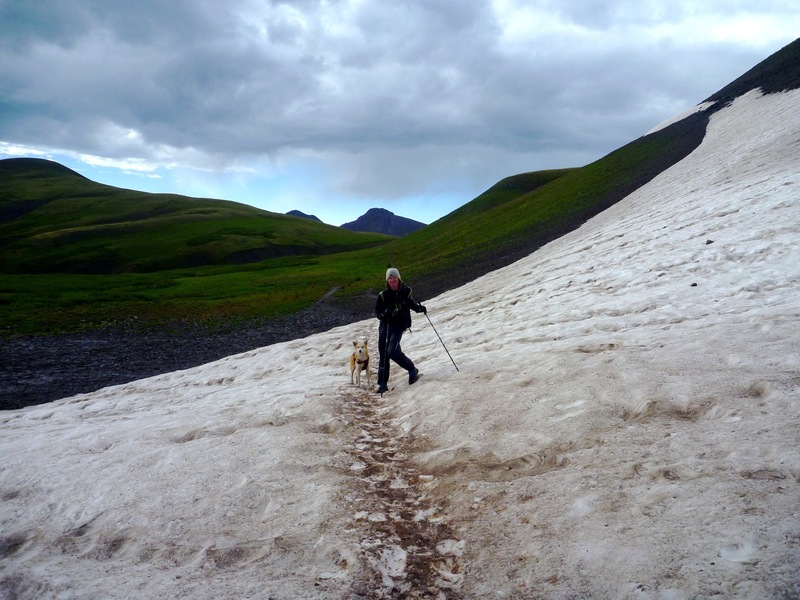 The hiking was easy going and it lulled us into changing our decision to head into Silverton tonight. We came up with the plan that we would camp tonight, and thereby save $75 to $100 and then head into town in the morning. We found a perfect spot to camp, but it was being occupied by a large, loud crowd of weekend backpackers. They asked us about the C.T., and we were very polite, but I have to admit I have doubts if they could do the trail. They look to have neither the physical nor mental toughness to pull it off. My opinion dropped further still when they left and we came to occupy the site and found that one member of their group had taken a large dump right in the middle of the area and left their toilet paper scattered about. Why folks come into this gorgeous country and trash it is beyond me. I'd prefer these type of people stay home. Of all the animals we have met out here, and there are many, humans are the most inferior of the bunch. We are the loudest, the slowest, the fattest, the ugliest. Without our tools, we are effectively useless out here. With them, we have the power to destroy beauty and all that is wild. We continued down, being swarmed by flies, no doubt attracted by the massive piles of human feces found in every potential campsite. 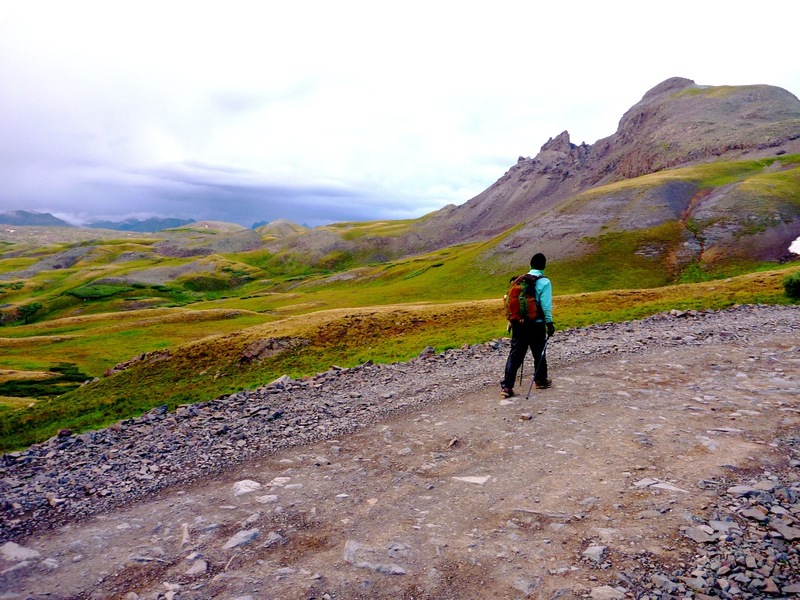 We saw many backpackers coming up – apparently there is a popular loop trip up here. All of them had HUGE packs – GPS devices (for every member of the group? ), unopened cases of bug fire sticks and teddy bears. What do they need all this crap for? The labored and sweat. I won't lie – I felt a bit of satifaction having just crossed nearly the entire state with a 20 pound pack. They probably thought we were just out for a day hike! 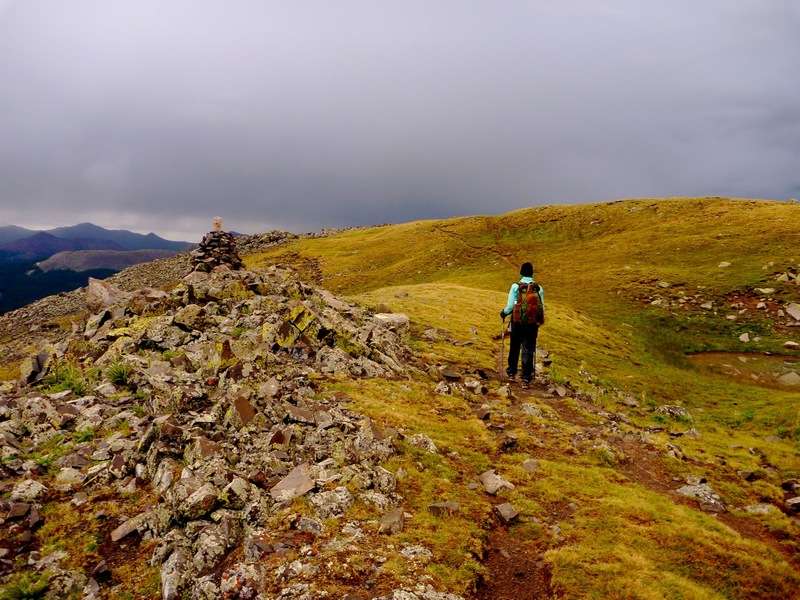 The mantra that the farther you go, the smaller your pack is holds true. After a lot of searching we finally found what looked like a decent campsite right next to a flowing river. We set up camp, tried to nap, but the flies were hellacious. It was not comfortable and certainly not restful, so we hastily decided to push onto Silverton – at 4 pm. We were hungry and wanted food badly. We flew along the trail, motivated by burgers and pizza and ice cream. We came to the Animas River, the last major water body of our trip, that flowed into Durango. 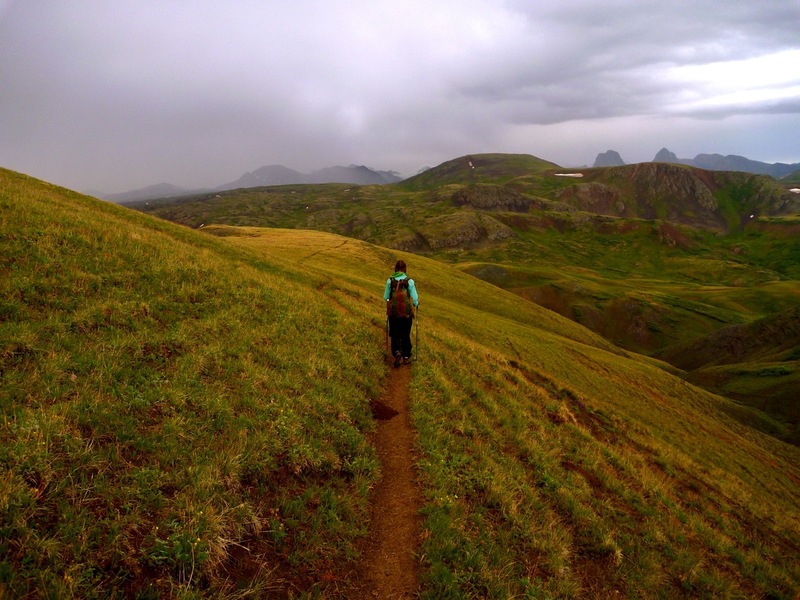 We had an option here: head up the trail 1,000 plus feet to Molas Pass and try to hitch hike into town or hike along the narrow gauge railroad tracks to Silverton. We seriously considered the latter, but had heard rumors that it was illegal and the railroad workers are rather thuglike in their punishment methods. As such, we headed up the trail. Within minutes rain started to fall again. This wouldn't be much fun to hitch hike in, especially with a dog. It was about 6 pm and the day was growing short. Even if we did make it into Silverton, most eating establishments would be closed by the time we got there. 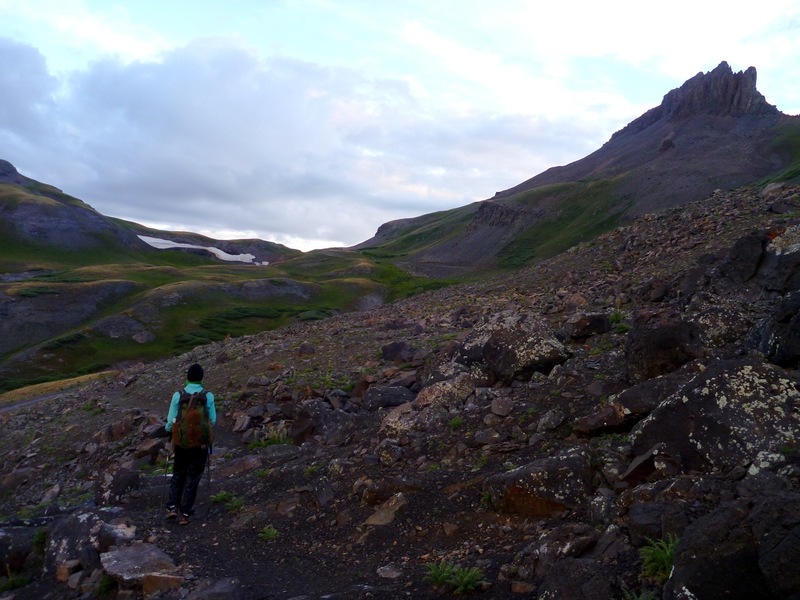 We forged up more switchbacks to a large valley, where we opted to set up camp for the night. It was a good decision. The campsite was beautiful, fly-free, had a nice little creek and a magnificent view of the towering Snowdon Mountain above. We ate our remaining rations (we'll restock tomorrow) and made scrumptious macaroni and cheese. It was great night that ended an unusual but beautiful (and ugly) day on the trail. Time is passing. It is noticably darker at 5 am today than it was two weeks ago.